Address: Room 1180-1182 B Bld, Qinghu Kejiyuan, Longhua Dist, Shenzhen, 518109 China. 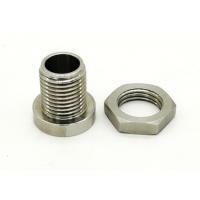 Stainless steel Nut and Bolts is used for Heaters, Tubular Heaters or Tubular Heating Elements. Material: SS201,301, 304, 316, 316L etc. Size: M8, M12, M14, M16 and so on. Application: Heaters, Tubular Heaters or Tubular Heating Elements. Stainless Steel: SS201,301, 304, 316, 316L etc. Steel: 4140, 4340, middle steel, Carbon steel, Q235, 20#, 45# etc. Iron: 1213, 12L14, 1215 etc. Aluminum: 6082, 6061, A380, Al6061, Al6063, AL7075, AL5052 etc. Alloy Steel: 4140, 4130 etc. Finish Treatment: Polishing, Sand Blasting, Anodizing, Zinc Plating, Nickel Plating, Blackening, QPQ, Painting, Coating, etc. Mechanical Equipments and Other customized Parts. By air for medium weight and volume. Q1: Could I get samples for testing? A: Yes. We could offer free samples for small parts, but for bige and high-value products, samples will be charged. Q2: What's your delivery time? A: Generally it is 5-20 days if the goods are in stock. or it is 15-25 days if the goods are not in stock, it is according to quantity. Q3: How can I get a Quotation from your company? A: We can according to your drawing design, material and quantity and give you the best price. Q4: What's your company payment? A: T/T, L/C and so on. Total amount less than 5000 usd , T/T 100% advance. More than 5000 usd will 50% advance, balance before the shipment.